Internationalizing an application and assuring that all its messages are actually translated is one of the most frustrating, hassling and time-consuming tasks that developers must face. Symfony is decided to drastically simplify this process while boosting your productivity. That's why in Symfony 2.7, the web debug toolbar will show a new translation panel. Translation messages are divided into three categories: defined (the messages that have already been translated), missing (the messages left to be translated) and same as fallback (messages which aren't translated but are available in the default locale configured in the application). 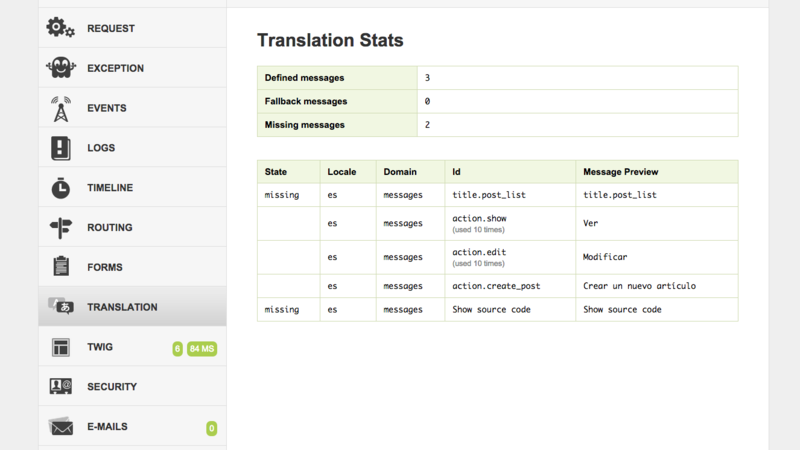 This table shows the detail of the application messages, including their domain, the times each of them have been used and a preview of the translated message. Nice addition! The web debug toolbar is very powerfull! Nice feature! The only problem is choice form type, which tries to translate every label in a choice list (take timezone or country choices for example) This results in a lot of missing translations, which are actually not missing.